Recent studies show that bamboo provides higher incomes and benefits for the environment. Tobacco is an important cash crop that provides steady income for communities in many low-income and bamboo-resource countries worldwide. At the same time, most of these countries, 168 to date, have signed the World Health Organization Framework Convention on Tobacco Control, agreeing to actively reduce tobacco use in their societies. In many locations, bamboo is an ideal development tool that governments can use to comply with this international agreement; and wean smallholder farmers off tobacco and into a range of new farming enterprises. This is good for people’s health, good for their income, and good for the environment. A number of initiatives and studies are in progress to provide evidence and promote the benefits of bamboo as a viable replacement crop for bamboo. 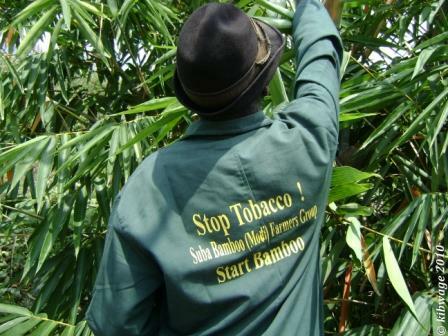 In Kenya, the Tobacco Control Research Group (KTCRG), for example, is assessing the costs and benefits of bamboo over tobacco for rural development. Results emerging from this effort show that it brings a range of health, environmental and income advantages to families who switch from tobacco to embrace bamboo. As always with cash crop replacement and alternatives, a key issue for a farming community is to find a replacement crop that retains the same income level, or increases revenue. Studies by the Kenyan team show positive results on this front, with bamboo having an earning potential that is much higher than tobacco, in ideal conditions. KTCRG project leader, Prof. Jacob Kibwage says that bamboo plants perform well under the same agro-climatic and soil conditions as tobacco, and the annual estimated income from bamboo farming will be 5-10 times higher than tobacco, depending on the use of the plants. Reports of bamboo for tobacco replacement have also been found in Bangladesh, Brazil and Zimbabwe. Efforts are likely in progress elsewhere. A Bangladeshi rural development specialist comments that she does not see bamboo as an ‘alternative’ to a new crop, but instead perceives farmers returning to their original crop – bamboo. -What is your experience with bamboo-tobacco replacement? -What is needed for more countries to scale-up programmes to help their rural communities? -Leave your comments here or contact the INBAR team.